We see it time and time again during the season and quite often in the off season. Customers come in with that look in their eyes. They have done their research and been to every store in town. But they’re just not sure which stove to buy. Every store gives them a little different story and after you have looked at 50 stoves they really do start to look the same. So how do you really know which one to get? Well I can tell you this. Not all wood stoves and wood inserts are created equal. That is why every year all the major sales reps from the stove manufacturers come into our store and tell us why their stoves are the best. With a name like Portland Fireplace Shop you can imagine all the choices presented to us. 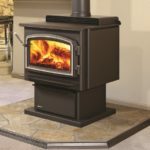 So you might ask why do we carry Regency wood stoves and not other brands like Quadra Fire, Lopi, Pacific Energy, Avalon, Country, Hearth Stone and the list could go on and on? One reason “The Warranty”. You’ve heard the saying “It’s not what you know it’s what you don’t know that gets you”. The same is true when buying a stove. It was Regency’s warranty that sold us and made us want to bring their product to you. See, most of the manufactures offer a warranty or even say it comes with a lifetime warranty. It’s in the small print were they get you. They say the stove or the fire box has a life time warranty. But way at the bottom it will say parts not mentioned have a (fill in the number) year warranty. So what about that glass that cracks in 5 or 6 years? No, it’s not covered. It just cost you $250.00 to replace because it’s ceramic glass. How about those hinges that wore out after 9 years? No, they’re not covered. Well what about the stainless steel air tubes at the top of the firebox that burned out after 15 years? If you own one of those other manufactures stoves, those aren’t covered either! Regency is the only stove manufacture that gives a “true” lifetime warranty on their stoves. There are only 3 things that aren’t covered for a lifetime. The gasket rope around the door, that will need to be changed out every 10-15 years . The fire brick in the fire box will get changed every 10 years. And the fan box has a 2 year warranty on it. Keep it clean and you may never have to replace it. Buying a stove is really pretty easy when you know what your not suppose to know. stoves have the same lifetime warranty as they did last year? And when they say yes, we just tell them “We are going to stick to being a proud Regency dealer”…And now you know.